Is Aereo, a service that lets consumers stream over-the-air TV, akin to a cable company or a hardware provider like RadioShack? The justices of the Supreme Court appeared to struggle with that question on Tuesday morning as they listened to oral arguments in what many media watchers view as the most important TV-related court case in decades. 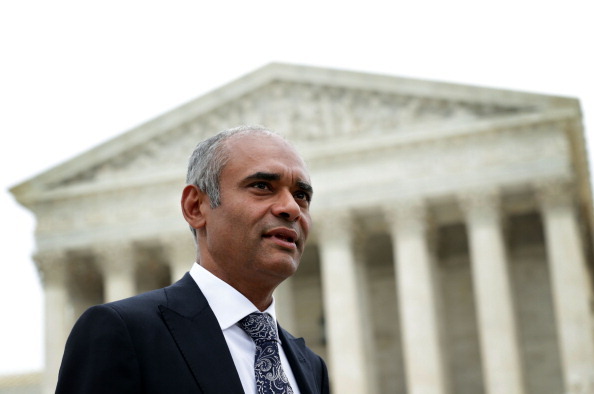 In deciding how to respond to broadcasters’ claim that Aereo is violating copyright, the court expressed repeated concern over how to write a ruling that did not create major ripples for the rest of the TV business on one hand, or for the cloud computing business on the other. “It makes me nervous about taking your preferred route … Where does it stop?” said Justice Stephen Breyer, addressing Paul Clement, the lawyer for ABC and other big broadcasters that want to shut Aereo down. Breyer and other Justices expressed particular concern about the broadcasters’ claim that they have a public performance right in Aereo’s transmissions, which are controlled by its subscribers. Breyer pointed out that a thousand people can — and do — store a file in a personal cloud service like Dropbox, and can play it back at the same time — which could be considered a public performance under the broadcasters’ version of the case. The “public performance” question is the central issue in the closely-watched case, which turns on whether Aereo’s antenna technology, infringes broadcasters’ copyright, or if the service is instead an extension of existing legal services like remote DVR’s. Chief Justice John Roberts also pressed Clement, noting that Aereo appears to provide an antenna in the same way that RadioShack does. But he also expressed deep skepticism over Aereo’s technology, asking why it rents out tens of thousands antennas rather than using just one. “Is there any reason you need 10,000 of them?” asked Roberts, suggesting the only reason Aereo’s technology operates this way is to get around copyright laws. “There’s no technically sound reason to use all those antennas,” added Justice Ruth Bader Ginsburg. David Frederick, the lawyer for Aereo, responded by suggesting that modular designs help startups who don’t know how quickly they will have to scale up and that, in any case, efficiency questions are irrelevant for copyright purposes. The justices also pressed Clement over how the court could square a ruling in the broadcasters’ favor with the decision in a case called Cablevision, in which an influential appeals court ruled that remote DVR’s are legal. The court noted that the Cablevision ruling was not binding on it, but that the outcome appeared correct. Clement responded by stating that the outcome in Cablevision was indeed correct, but that the lower courts’ reasoning for allowing remote DVR’s was all wrong. For copyright watchers, the Justices’ questions left no clear indication of how the case will turn out. While Ginsburg appeared, as expected, to be clearly in the broadcasters’ camp, the other Justices expressed repeated concern over the cloud computing issue, and also expressed sympathy at times for one of Aereo’s central contentions — that the signals that are picked up by its customers’ antennas are local over-the-air transmissions that are free already. And, in a possible nod to an argument made in a supporting brief signed by 36 law professors, several justices suggested that what the case was really about was a reproduction right — not a public performance right. As Frederick was quick to point out, the broadcasters chose not to rely on the reproductive right argument because, had they done so, they would have run afoul of a seminal case 30 years ago that found private copying by VCR’s does not infringe copyright. The case is significant not just for Aereo, which operates in 11 cities and is backed by media mogul Barry Diller, but for the entire TV industry. The broadcasters have warned that they may remove their over-the-air signals, and become cable channels if Aereo wins. Barry Diller, whose company IAC had put up most of the $97 million invested in Aereo so far, says the company is “finished” if the court grants the broadcasters an injunction. From our perspective, the issue in the case was whether consumers who have always had a right to have an antenna and a DVR in their home and make copies of local over-the-air broadcast television, if that right should be infringed at all simply by moving the antenna and DVR to the cloud. The court’s decision today will have significant consequences for cloud computing. We’re confident, cautiously optimistic, based on the way the hearing went today that the Court understood that a person watching over-the-air broadcast television in his or her home is engaging in a private performance and not a public performance that would implicate the Copyright Act. A decision is likely to come sometime in June or July. The case attracted considerable attention, including an overnight line for seats that began forming on Monday evening. This has puzzled me from the beginning. How does it hurt broadcasters if I choose to unplug my roof antenna and instead plug through the internet to one at a different location? Seems to me it enhances their business if anything. That’s all I see happening here. Is there a fear that it will lead directly to something I’m not seeing? I would understand the motivation if not the case were the cable companies the plaintiffs. even when said advantage goes against the very people the rule makers purport to represent â€¦the term (quiseling) come to mind ..
That being said one wonders how (supreme court) will justify â€œcontinuingâ€ to give freely… â€œpublicâ€ spectrum to private companies whose value proposition is only I can use any program I broadcast over spectrum given to me for free â€¦ it says here if the deal to allow private companies to use public spectrum was being cast under todays conditions …said value proposition would not fly ..
‘Guess this is recognized in Justice Breyer’s Dropbox argument already. Aereo argued their business model rather than a normative principle… I feel. Thus Aereo’s limited inability to enforce IP… meets… broadcaster’s symmetrical technical inability to reflect heterogeneous public choice… Technical inabilities might as well inform law, once they are associated with objects of law. Fingers crossed that whatever legal novelty comes about after all bad choices will be expedited ! Any idea whether / how when ‘fair use’ was touched on in this case ? The FCC will not allow broadcasters to stop their OTA broadcasts, and all lsides know this going forward. Empty threat. You misunderstand. The local broadcasters will keep their signals on the air in fulfillment of their FCC licenses. They will never cede their broadcast spectrum voluntarily. But the owners of the big 4 broadcast networks (NBC, ABC, Fox and CBS) will pull certain types of content OFF their broadcast networks and distribute them through cable channels instead. This is simple to accomplish because the same company that owns NBC owns NBC Sports; the same company that owns ABC owns ESPN; the owner of Fox owns national sports channel Fox Sports 1 and numerous regional sports networks; the owner of CBS owns CBS Sports Network. The outcome here is that “free” over-the-air TV will no longer have professional or high-profile NCAA sporting events in its line-up, because all of that content will be snatched off broadcast and put on channels that people can ONLY get by paying for them. Part 1: What if an inventor made an antenna that could be mounted on my house in DC, but unlike other antennas this antenna could tune stations from the entire world? Would selling that type of antenna be an infringement of copyright? Part 2: Now assume that the antenna doesn’t work well unless the seller of the antenna also services the antenna once a month for $5. Does that make the service a “public performance”? If the answer is no, then how is this meaningfully different from Aereo? Actually, Aereo is more limited in your scope than you’re suggesting there – you only get the local channels from the city you live in, not the entire world. So you’d think Aereo’s legality would be even less of an issue. It’s disconcerting to hear the broadcasters threaten to throw out the baby with the bathwater by moving from over the air broadcasts to cable and satellite only, over what by all accounts that I have read would be a loss of about 10% in their revenue that they make from retransmission fees. Remember that they make 90% of their revenue from advertising, which would not be affected by Aereo. Cry me a river. It’s a stupid regulation anyway – why shouldn’t live retransmission be allowed, even with a single giant antenna, at least to places that should be able to but cannot receive the original transmission for some reason? It makes no sense, because the original transmission is free. I understand that broadcasters in some other countries actually have to pay the cable and satellite providers to carry their channels, which actually makes more sense than the current situation in the US. Besides, if they want to quit over the air broadcasting, let them! Let’s use their spectrum for more useful things like internet access and other innovative technologies! typo? ‘says there is â€œfinishedâ€ if the court grants’. Shouldn’t that be ‘says they are â€œfinishedâ€ if the court grants’? If Aereo only had one antenna, they would be essentially re-broadcasting. By renting an antenna to each user, they are not broadcasting, and are performing a receiving and recording service for their customers. The court should recognize that the problem is not that Aereo uses thousands of antennas, but that the copyright laws are poorly designed. “but that the copyright laws are poorly designed.” Not the issue, not the case before the court. I didn’t say they were, but that the court should find in favor of Aereo because the laws don’t give the plaintiffs the rights they are claiming. Interesting that the case seems like it’s going to turn on the cloud computing argument. I figured when the Justices asked why so many antennas are required, that the number of antennas would *be* the real argument. I assumed the argument today would be about whether Aereo is a public re-broadcaster or simply a lessor of your own private antenna & DVR, considering owning your own private antenna and DVR have already been declared legal in the Supreme Court.